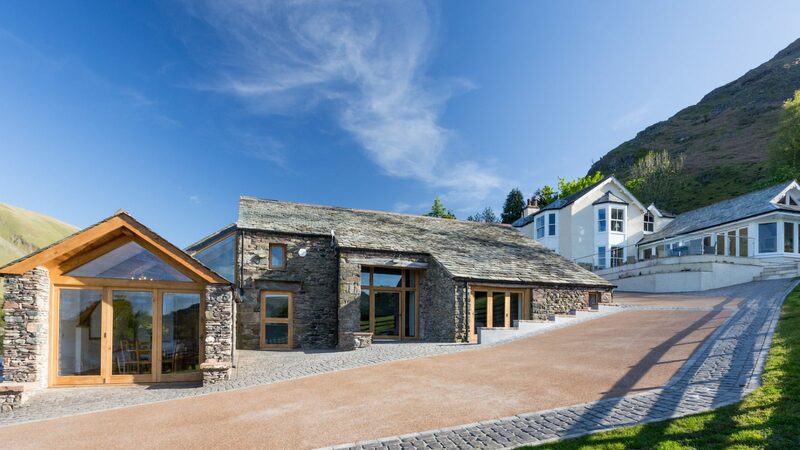 Beckoning the lake and fells in through its walls of glass, Ullswater Barn sits serene and sumptuous at the head of Ullswater. 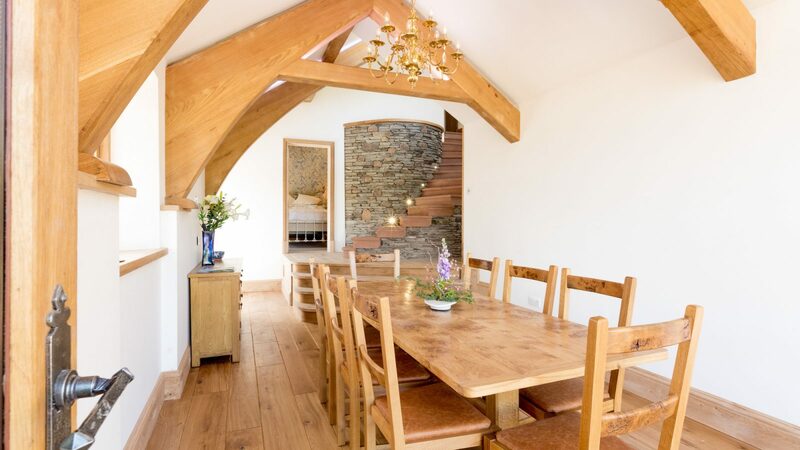 Get together beneath the oak beams, on the patio above the lake, or in the minstrel’s gallery. This is the place you saw in your mind’s eye. Relax, and hear only the water. At Ullswater Barn, Ullswater seems part of the garden. It sits serene, ahead of a half-mile of shoreline that’s all yours. But it’s hard to say which is more serene – the lake water or the barn. 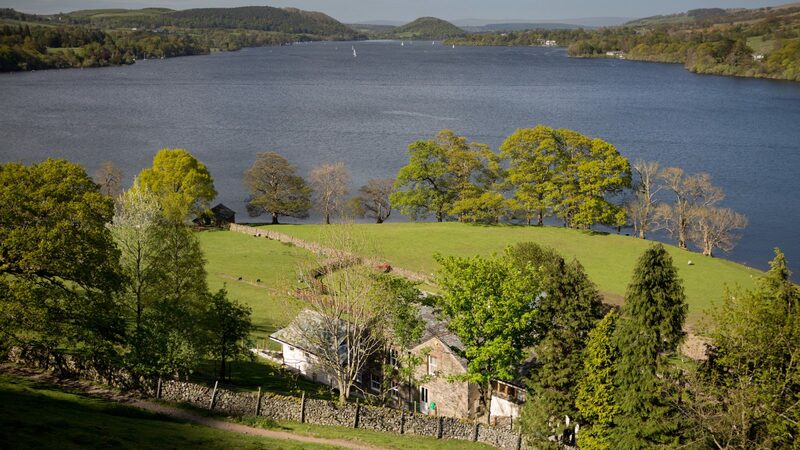 Bolted into the Cumbrian landscape, Ullswater Barn beckons the lake and fell views in through its walls of glass. They stay with you, casting their light and life on the luxury fittings that surround you. Beautifully appointed could be understating it. 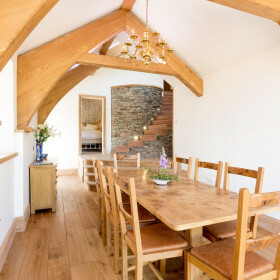 Modern oak beams abound; balustrades are glass; spotlights in the kitchen twinkle above the smooth and clean surfaces. 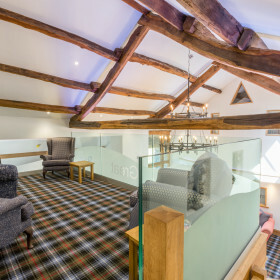 Tartan carpet from the Lake Room takes you to the minstrel’s gallery. 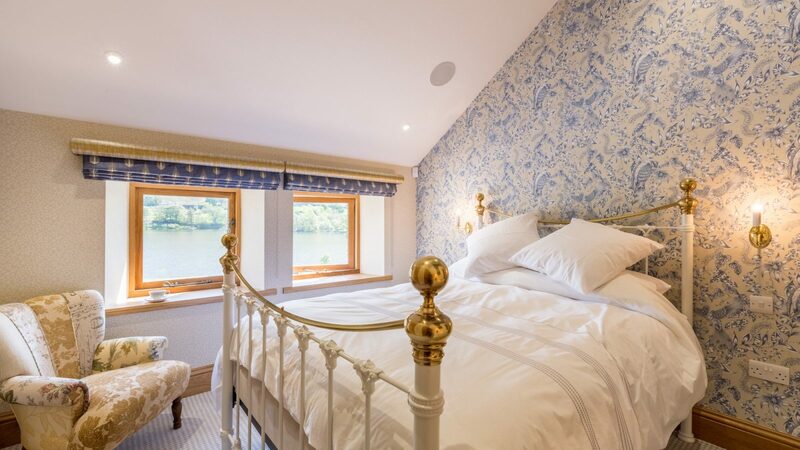 You’ll dine with a view over the lake and sleep to the sound of the breeze rippling the waters. Play with the iPad to control the mood lighting and integrated sound system. 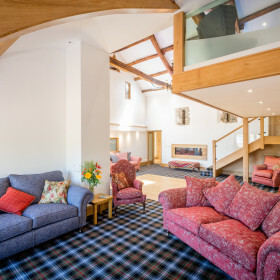 Fire up a family film night or hide with a book in the snug. Escape this world entirely on the private jetty where the lake water that laps the boathouse is the only sound. Dine al fresco on the patios as the lake steamers chug on by. 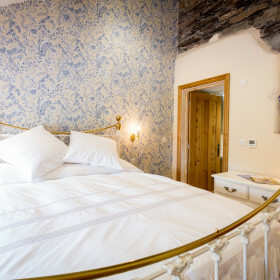 As the last drop of wine disappears with the sun on the horizon, retire to Brinkhaus Pyrenean duck down pillows, Villeroy and Boch bathrooms, Vi-Spring mattresses and flat-screen TVs. Wake with a spring in your step and the call of the fells in your ears. It’s nice to have a lake in the garden. 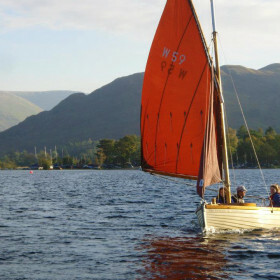 Especially when it’s Ullswater. The fells cascade down to the water and the lake steamers chug past. But the beauty has already begun before you even arrive, as you meander the twisting Lakeland passes past mountains, lakes and streams. Beyond the security gates, you’ve got half a mile of shoreline all to yourself. Run wild with your thoughts or walk off a meal. This is a 26-acre slice of Lakeland with serenity at its heart. 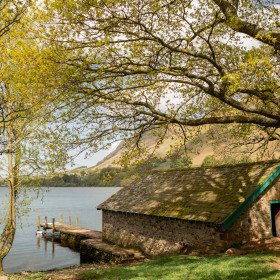 On the jetty by the boathouse, seclusion is yours. So escape your cares awhile – either by canoe or just in your mind. Outside is out of this world here. 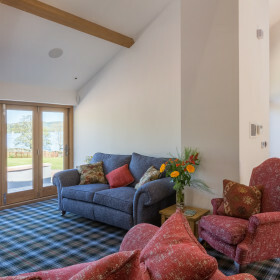 Drink and dine on the patio with the fellside backcloth, walk the hills, bike the trails. Want to arrive in style as well? If you have a yacht or helicopter in mind, just give us a call. 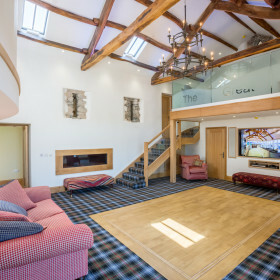 The Lake Room is a cinema, a dance floor, a games room, or just a place to gather in gregarious groups with the ones you love the most. 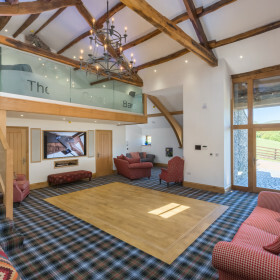 The modern oak beams and glass balustrades set the tone. You just pour the drinks and press play. Want to break out with a book? 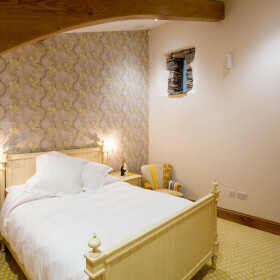 Escape to the squishy sofas and the calm serenity of the minstrel’s gallery or the snug. On warm days, open up the doors to the lake and the mountainous beauty beyond. Technology’s part of the party here, too. 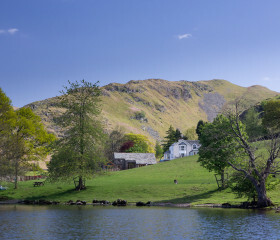 WiFi floods the Ullswater Barn. You can keep everyone chilled with the mood lighting, fingertip-controlled with iPad technology. And you can set the soundtrack to your stay with the integrated sound system. Beneath the mood lighting, the kitchen sits sleek and spectacular. Break the bread at breakfast, chop the chorizo for dinner. 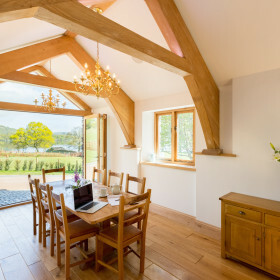 Eat indoors or out, or break open the bifold doors to the beautiful dining room and do both. Let in the lake breeze as the wine flows with the conversation. Get together, review today and plan your tomorrow. 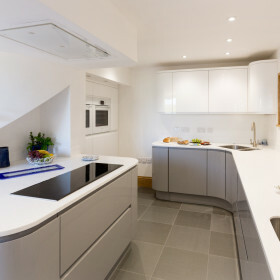 If you’re a closet Nigella, you might enjoy the electric oven and induction hob, the kettle tap and the waste disposal. 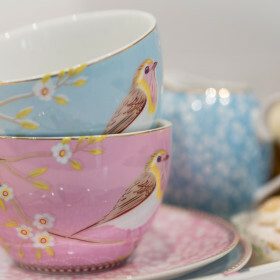 If not, try a little pampering over the catering. Just say the word and we’ll send along our chefs. From a one-off celebration to a fully catered break, we’ll wear the whites while you get stuck into a red or rosé. We’ll even deal with the dirty dishes afterwards. Eating out? 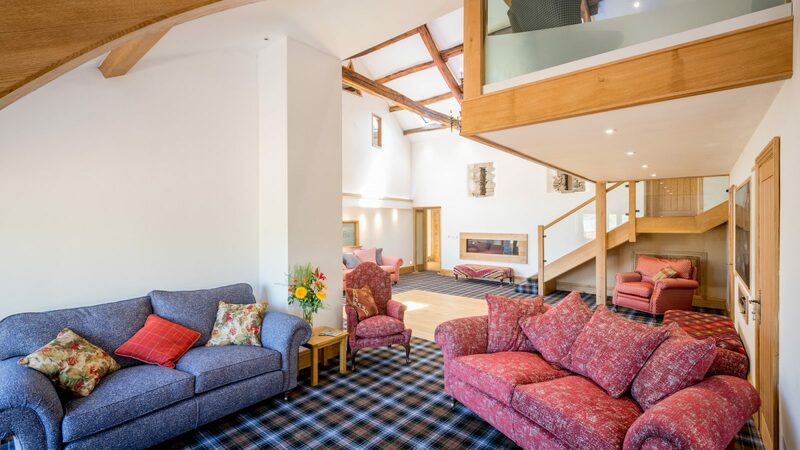 Try Gressingham duck or Lakeland lamb at the Glenridding Hotel’s Garden Room Restaurant, with light snacks in Kilners Coffee House next door. Or try a roast or rib-eye in the Fellbites Café. 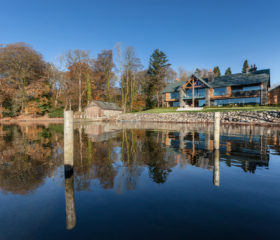 A coveted Michelin star shines brightly in the near distance at Holbeck Ghyll in Windermere. 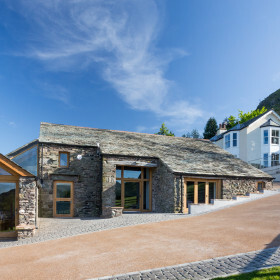 Ullswater Barn sleeps eight in four bedrooms, in sumptuous comfort. 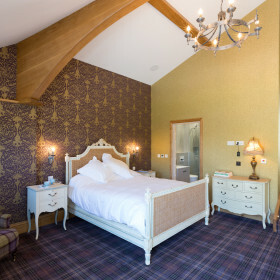 You’ll sleep in an And So To Bed hand-crafted double, on a Vi-Spring Elite mattress with Brinkhaus Pyrenean duck-down pillows under your head. Set the mood lighting low, switch on the TV and revel in the surround sound. 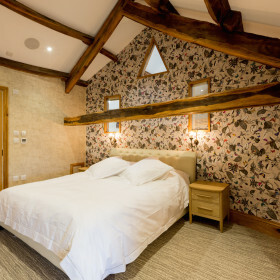 Bedrooms won’t be battlegrounds at the Ullswater Barn. Each is as beautiful as the next. Character comes from the 17th century; technology from the 21st. Set the soundtrack with the integrated Bluetooth. 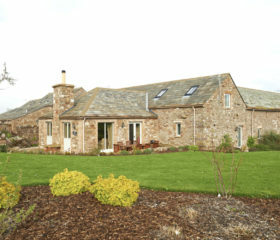 Pad over heated floors to the natural-stone bathrooms with Villeroy and Boch fittings. Lose yourself in a monsoon or raindrop shower. 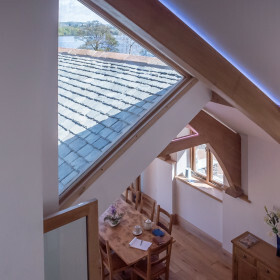 Cockpit is quirky and characterful with lake views, low beams and oak furniture. For a water’s-edge feeling, choose Loadpot. 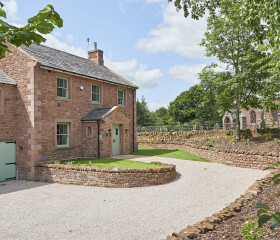 Butterwick comes with characterful beams and original arrow-slit windows. Finally, Ravenhowe could start a squabble. 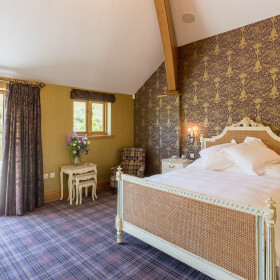 On warm evenings, open the doors onto the terrace and let the lake breeze ripple the sheets. 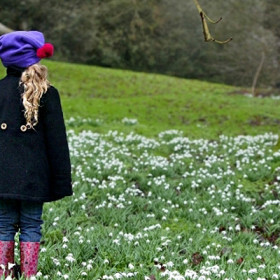 Trek the trails, scramble the ghylls, walk the ridges. 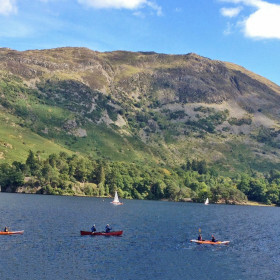 Cruise or canoe the lake, climb up to Aira Force, solve the ancient mystery of the Long Meg stone circles. Picnic by the shoreline, potter the shops at Penrith. Swim outdoors at Askham, make animal pals at The Alpaca Centre, let your imagination loose at Lowther Castle.